If you are planning to conduct a Direct Mailing campaign then there is a lot of information that you will want to take into account, especially if you have never been involved in one before. Approved Index can provide you with a wealth of information covering the whole process from start to finish, as well offering free quotes from the UK's best Direct Mail Marketing companies. Direct mail and direct marketing can be useful for businesses in a range of industries and for a number of reasons. Offering distinct advantages in marketing and sales, making use of this medium can help your business to significantly improve both sales and branding. Indeed, few marketing channels offer better opportunities for small and medium businesses to get in front of their potential clients and customers. Read on to find out more about direct mail marketing and to discover how it could help your business. If you want to compare suppliers today however, simply fill in the form above to get started. Let Approved Index help you find the best Direct Mail Marketing Company for your business. Direct Mail Marketing is a popular tool for advertising where companies send printed materials directly to potential business clients or consumers on specifically targeted mailing lists. Although it is often mistakenly associated with ‘junk mail’, direct mail marketing is as useful now for brands spreading awareness as it ever has been according to every key performance indicator (KPI). Indeed, recent surveys have shown that prospective customers are more happy to receive contact from businesses through the post than by any other method of communication. Generate sales. Sending potential customers material highlighting the features and benefits of a product or service can help generate sales enquiries from both new and existing customers. Brand awareness. Informing customers about changes in your company and to your products or services can help with retention as well as growth, with strong branding making it more likely for existing customers to recommend your services or products to new ones. 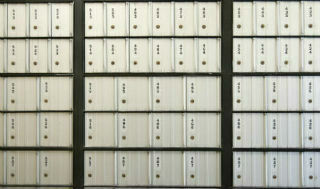 Direct Mail services can be invaluable to companies when they are used in the correct way. By buying data that is good quality, and using mailing lists with well-targeted advertising material, direct mail marketers can expand brand awareness and raise sales without falling into the ‘junk mail’ pitfalls. Direct Mail advertising costs can be factored to make sure that your budgeted strategy leads to success, especially when marketers plan their campaigns to match industry best practice as closely as possible. Mailing Lists are vital for anyone looking to get started with their direct mail marketing campaigns - they can be created based on existing customer contact information or they can be bought or rented from mailing list brokers who specialise in the area you are working in. What is a Direct Mailing List? A direct mailing list is a collection of names and addresses for people that a company can contact with marketing material. This material can be designed either to advertise new products or services, or simply to raise the profile of your brand. Direct mailing lists are often bought or rented, and thanks to long years of practice, brokers are able to provide information and addresses to suit the vast majority of industries. Marketers can very easily define their objectives and location to ensure that the mailing list they receive is of the highest relevance to the strategy they mean to implement. Whatever your business or industry, it’s likely that you could benefit from a direct mailing list. If you have advertised before but have not been as successful as you’d like, or if you haven’t ever had a go but want to, buying a direct mailing list is a great step to take. A mailing list broker can also help in other mediums as well, with both email marketing and telemarketing relying on this kind of information. There are two options for direct mail marketers looking to advertise their products or services: rent or buy a list, or create your own. In either case it is important that you regularly update it to stay in line with direct mailing best practices. For those who have never carried out a direct mailing campaign, buying or renting from a broker may be the safest decision. Buying or renting is also a great way to get to know the process for future reference, without having to spend a great deal of time on it yourself. If you do choose to approach a list broker to source this information, be sure to factor the cost as part of your overall direct mail price plan. If you are interested in creating your own mailing list, then there are several methods that companies use to collect information. Examine your sales records. If you have been in business for a while, then you probably have data that you can revert back to. If you have delivery addresses for customers who have bought from you in the past, keep them. Incentives. Offer people a reason to sign up to be on your mailing list. Draw them in with prizes or exclusive discounts, and keep offering them to keep people interested once you’ve caught them the first time. Talk to customers. This may be the simplest way to get the information, but a lot of businesses don’t make the most of it. Speak to customers at checkouts or when you’re doing business with them. Ask them if they’d be interested in future offers and deals, and then get their address. Even if you are keen to create your own mailing list, renting or buying one can be an excellent way to kickstart or boost your campaigns. Working with experienced professionals like the ones who work with Approved Index is an excellent way to ensure the success of your direct mailing. It is also important to bear in mind that, depending on your industry, you will need to approach or work with your mailing lists in specific ways; for example, b2c data will not be usable in the same way as your business data lists and so you will need to adjust your strategies appropriately. True direct mail advertising, when executed by a professional firm, will ensure that your business is never accused of sending ‘junk mail’, while at the same time maximizing response rates. This is achieved through a careful selection of prospect data and a strict adherence to industry best practice. Mailing List Brokers form an integral part of the direct mail process and employing the services of a reputable one is the best way to ensure that the data you use is as good as it can be. As well as ensuring that your information and research is as relevant as possible, a direct mail marketing company can help you to design and print your materials using methods most likely to provide your business with a decent ROI; for example, a direct mail agency will know that letters generally outperform marketing postcards and that a plain envelope is more likely to be opened than a branded one. This kind of industry knowledge is vital to making sure that your campaign is as successful as it can be. Most direct mail advertising agencies will provide just the services that you require, so it is possible to employ their services to aid in the design and print process, for example, without also having to buy data and mailing address lists. If you haven’t ever conducted a direct mail campaign, then employing an agency from start to finish may be the best way to make sure that you get the best results possible. Of course, for those who have conducted successful campaigns before, then it may just be a case of cherry-picking the services that best suit your needs. In either case, filling out the simple form at the top of this page is an excellent way to compare services and prices from a number of direct mailing agencies. Click the link below to complete our simple form and receive free, no-obligation Direct Mail quotes. 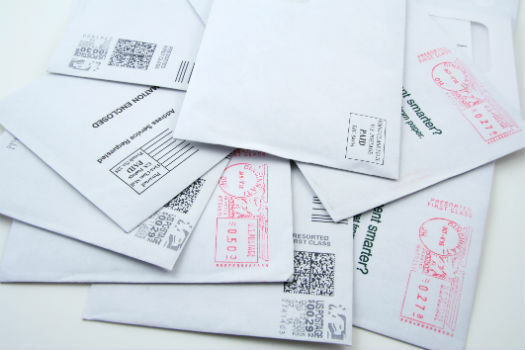 The benefits of direct mail marketing are varied and important to remember. Something like open rate, for example, is an excellent example of how effective a mailing campaign can be for a business, and is one of the advantages that places direct mail among the most effective forms of consumer communication. Open rates. Over 60% of all prospect mail gets opened. The physical presence of a piece of mail demands your target's attention and so, with direct mail, businesses have a unique opportunity to make an impression. Spending. The average UK consumer spends £600 a year on average as a result of direct mail. This figure alone makes it easy to see that, with the right campaign and material, a business can really benefit from a campaign that incorporates it. Response Rates. What some people have seen as a dying form of advertising has actually flourished in recent years with response rate increasing from 4% to 5% between 2004 and 2010. You are likely to see better results today than 10 years ago. Reception. In a recent survey by Acxiom, 57% of respondents said they were ok with receiving post from companies they had never done business with before. This statistic might surprise some, but it’s another piece of information that stands as testament to the advantages of direct mail. The evolution of the direct mail industry has been influenced in part by better data, but also by a determined effort to improve formats and to provide specialised and personal material that is more likely to solicit a positive response. The benefits listed above are just a few examples of the advantage gained by direct mail marketers over rivals that don’t use it. Quality direct mail campaigns can make brands, and take them to levels otherwise unreached. Using Approved Index's company comparison service is an excellent way to start finding out about these benefits for yourself. Your direct mail methods will vary depending on whether you are advertising to businesses or consumers. Fortunately, direct mail marketing agencies provide a range of services that can cater to both B2B and B2C companies. In either case, the advertising process will need to be relevant and targeted in a way that will best reflect a client’s desires. Usually, your B2B direct mail will need to filter through that business, examined by a lower-level executive before there is any chance of it reaching the person that can make purchasing decisions, so it is important that your advertising material is deemed appropriate enough to pass these various filters. B2C direct mailing on the other hand often requires a more personable approach that can sometimes depend on an emotional response, and other times on a consumer’s impulsive reaction. It’s likely that the first point of contact with consumer direct mail will be the person who will make the purchasing decision. As with business to business marketing, you may require a B2C data provider to help you get started. In either case, it is important that the direct mail marketer understands who will be receiving their material. Understanding what a consumer or business responds to, as well as how they respond to it, is key to making sure that the service or product you are advertising receives the attention you are hoping for. If you are considering running a direct mail campaign, then there is no better to place to start than with our simple form at the top of this page. We compare the prices and services of a number of companies so that we can offer you the best services, quotes and prices for free with no obligation. Approved Index Mailing Lists provide a quick and easy way to compare leading UK direct mail marketing agencies and services, so complete the form now to receive the best recommendations for your business.